This may not be a news flash to any stadium network operations team but the amount of mobile data consumed by fans at college football games continues to hit high levels, according to some new figures released by AT&T. In a press release blog post where AT&T said it saw 9 terabytes of cellular data used over the college football playoff championship-game weekend in the Bay area, AT&T also crowned a cellular “data champion,” reporting that Texas A&M saw 36.6 TB of data used on the AT&T networks in and around Kyle Field in College Station, Texas. 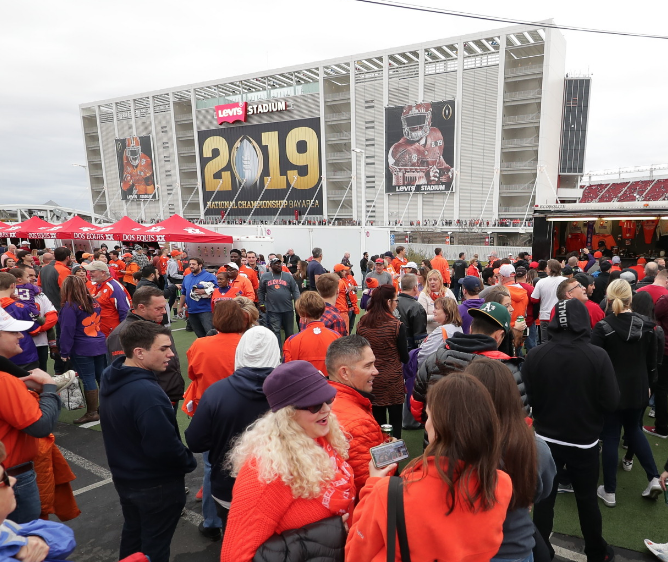 For the College Football Playoff championship, AT&T was able to break down some specific numbers for us, reporting 3.7 TB of that overall total was used inside Levi’s Stadium on game day. 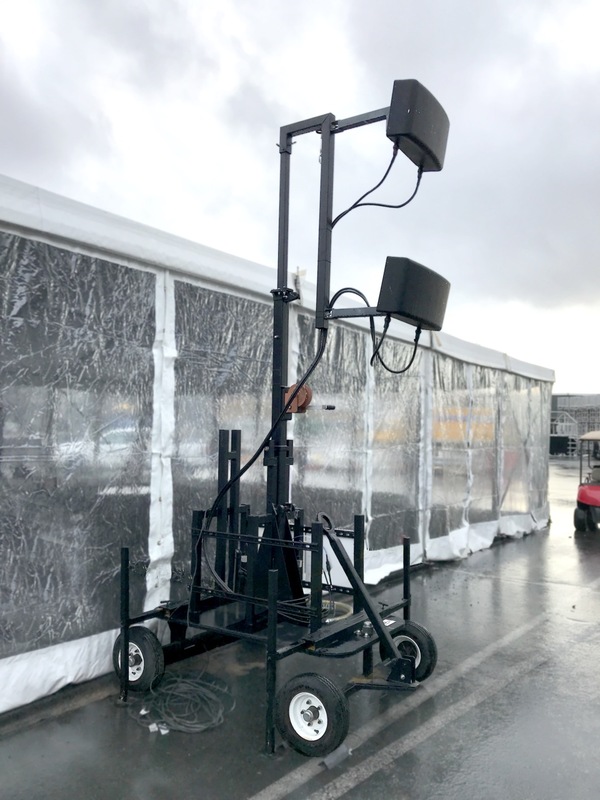 Cell traffic from the parking lots and tailgating areas (see photo of DAS cart to left) added another 2.97 TB of traffic on AT&T’s networks, resulting in a game-day area total of 6.67 TB. That total is in Super Bowl range of traffic, so we are excited to see what the Wi-Fi traffic total is from the game (waiting now for the college playoff folks to get the statistics finalized, so stay tuned). Any other carriers who want to add their stats to the total, you know where to find us. Back to Texas A&M for a moment — in its blog post AT&T also noted that the stadium in College Station (which we will identify as Kyle Field) had the most single-game mobile usage in the U.S. this football season, with nearly 7 TB used on Nov. 24. Aggie fans will remember that as the wild seven-overtime 74-72 win over LSU, an incredible game that not surprisingly resulted in lots of stadium cellular traffic. 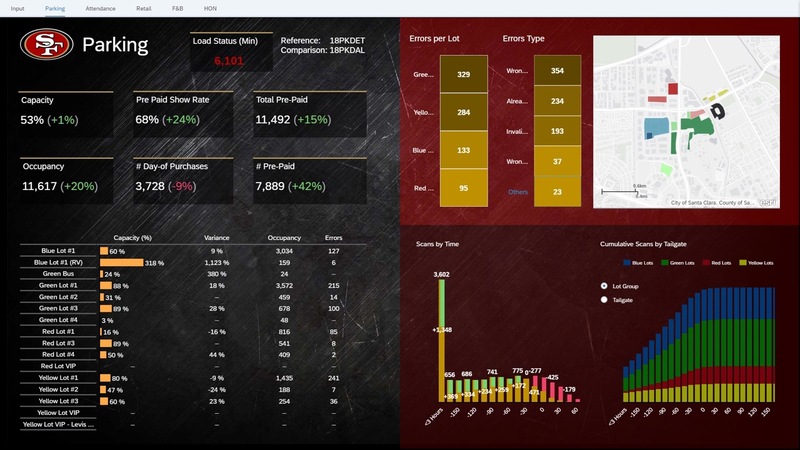 A desire by the San Francisco 49ers to see stadium operations information in real time has become a real product, with today’s announcement of Executive Huddle, a stadium operations management application developed for the Niners by SAP. In use at the Niners’ Levi’s Stadium since the start of the current football season, Executive Huddle brings transaction information from nine different stadium operations systems, including parking, concessions, retail sales, weather and fan opinions into a visual output that allows team executives to make real-time decisions on how to fix problems or otherwise enhance the game-day experience. Demonstrated at Sunday’s home game against the Los Angeles Rams, the software not only reports raw data like concession sales or parking lot entries, but also provides a layer of instant feedback to let team executives make immediate changes to operations if necessary. 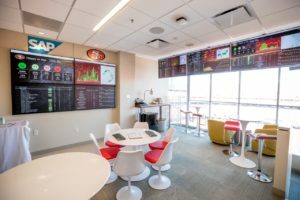 The cloud-based application, developed by SAP and Nimbl, is currently only in use at one upper-level suite at Levi’s Stadium, where the output runs during Niners’ game days on several video screens. SAP, however, plans to make the system available to other teams in the future, according to SAP executives at Sunday’s demonstration. 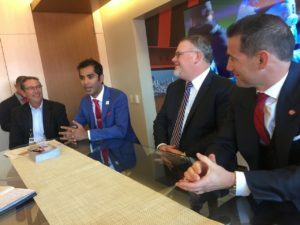 Al Guido, president of the 49ers, said Executive Huddle was the end product of a desire of his to be able to fix any game-day experiences on the day of the game, instead of in the days or weeks after. 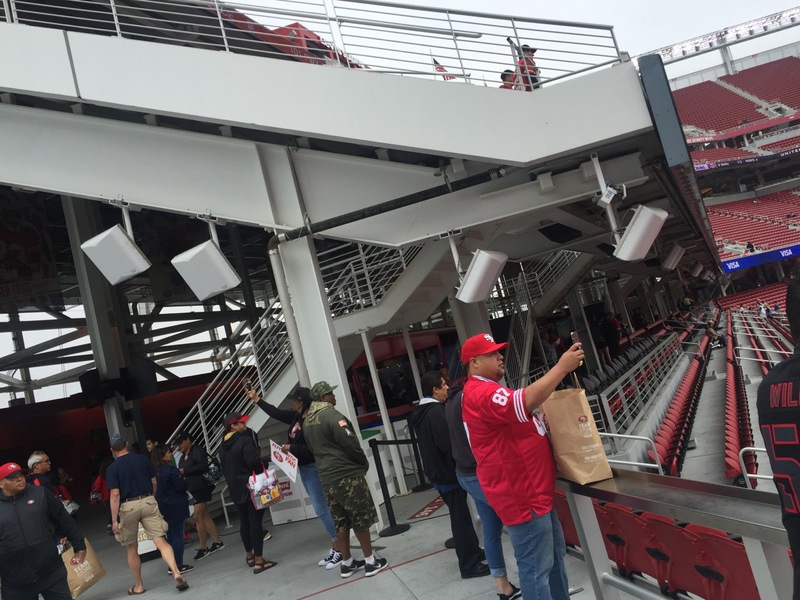 According to Guido, the Niners have been passionate about collecting fan-experience data since Levi’s Stadium opened in 2014. But in the past, the compilation of game-day data usually wasn’t complete until a day or two after each event, meaning any issues exposed were only learned lessons that needed to wait until the next games to be fixed. Things like slower sales at concession stands, or issues with parking-lot directions, Guido said, wouldn’t be known as they were happening, something he wanted to change. “I really wanted to be able to act on it [the operations data] in real time, instead of waiting until the Wednesday after a Sunday game,” Guido said. 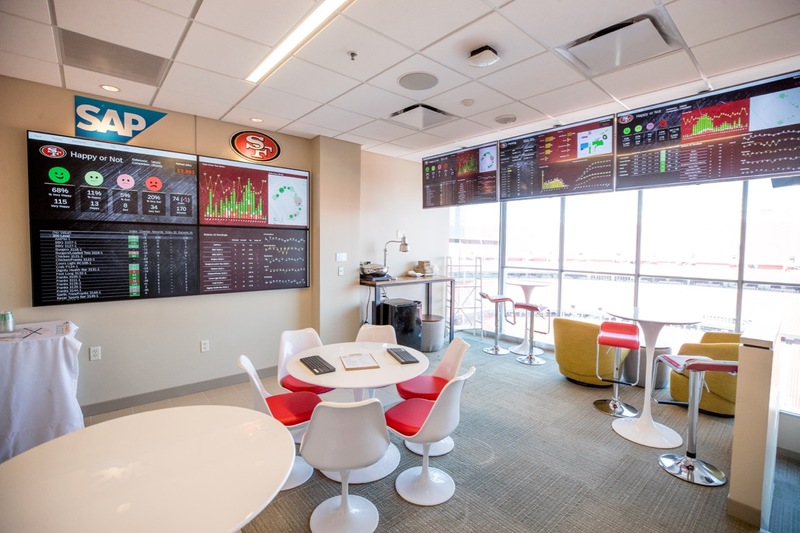 Now, with Executive Huddle, the Niners’ operations team can sit in a single room and watch as operations events take place, and can make in-game moves to fix things, like calling on the radio to a parking lot to tell gate operators of traffic issues. “It’s like having an air traffic control system,” said Mark Lehew, global vice president for sports and entertainment industry solutions at SAP. Lehew said SAP worked with the Niners’ list of operations vendors, including Ticketmaster, ParkHub, caterer Levy and point-of-sale technology provider Micros to provide back-end application links so that Executive Huddle could draw information from each separate system into the uber-operations view that Executive Huddle provides. 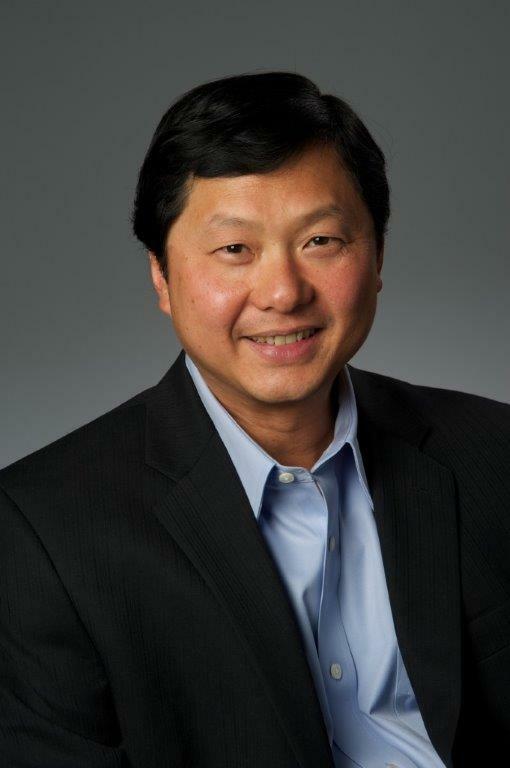 According to SAP, Executive Huddle is based on SAP’s Leonardo and Analytics platform. 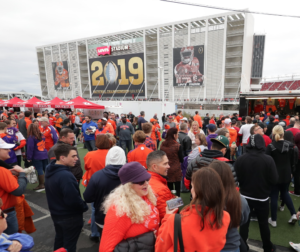 Moon Javaid, the Niners’ vice president of strategy and analytics, said the continued robust performance of the stadium’s wireless networks make them a lower-priority need for the kind of oversight Executive Huddle provides. Javaid, the quarterback of the program’s development from the Niners’ side of the equation, noted that part of its power comes not just from surfacing the data, but also from providing some instant intuitive markers — like red for declining metrics and green for positive — and the ability to compare current data to those from other events so that data could not just be seen but also understood, within seconds. And while SAP plans to make Executive Huddle available to other teams, it’s clear that the program — as well as education and training for the decision-making staff who will use it — will need different care and feeding for each stadium that might want to use it. 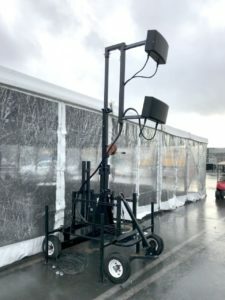 But SAP’s Lehew noted that being able to provide real-time data in an exposed fashion was becoming table stakes for operations providers, who would have to move past old ways of doing things if they wanted to be a part of the next generation of stadium service providers. 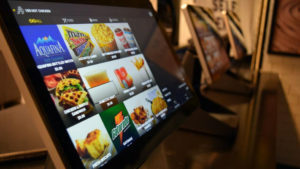 According to a press release out today, Appetize will install “more than 500” iOS- and Android-based terminals inside the Linc, including some touch-screen fan-facing checkout displays as well as self-service concession kiosks that are meant to function much like the terminals found at airports for checking in to flights. Kevin Anderson, co-founder and chief strategy officer for Appetize, said in a phone interview that internal company tests have shown that the self-service kiosks can speed up a concessions transaction by as much as 20 percent, good news for fans who are tired of spending lost minutes standing in line waiting for a cheesesteak. For teams and venue owners, the 10-inch screens being installed at other, regular concession stands in the Linc can help with upsell, as Anderson said that the screen space allows the operator to program in add-on options (like adding a drink or fries to a sandwich order) via a side-of-screen advertisement that makes it easy to add to the order with a click. In addition to the new customer-facing technology, Appetize is also gaining entree to venues for its cloud-based back-end systems, which Anderson said cuts out the need for teams to have localized infrastructure to buy and manage. Though he won’t name them all yet, in addition to the Eagles win Anderson said Appetize has claimed three other NFL contracts that were out for bid this summer, perhaps proof that the company’s mantra of having “enterprise and modern” facets in their systems is finding receptive ears. While MSR clearly needs to schedule a stadium visit sometime to check out kiosk wait times compared to older concessions systems, Anderson did note that teams can’t just plug the kiosks in and expect them to work with an existing infrastructure. 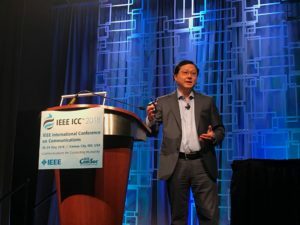 “There is a shift in operations” that is necessary, he said, since kiosks can double or triple the number of orders in a given time to an existing kitchen location. 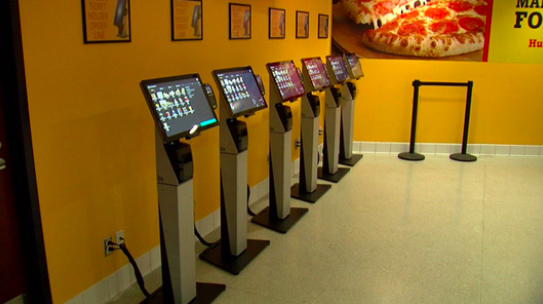 However, having kiosks also means that self-service stands can be staffed with workers who simply put orders together, instead of having to train those workers on payment systems and devices. One area where Appetize doesn’t see a lot of explosive growth is on the in-seat delivery end, a trend that seems to slowing down and finding its way mostly into premium seating areas at most venues. While Appetize can support mobile-device ordering and delivery (it even started its corporate life with an end-user focus on a mobile/delivery app) Anderson said the infrastructure and human engineering necessary to support a full-stadium delivery scheme is usually found to be unworkable. 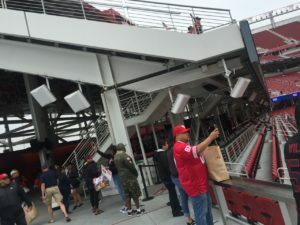 The San Francisco 49ers, who opened Levi’s Stadium in 2014 with mobile-app delivery of concessions to every seat, scrapped that service last season. “We’re definitely not seeing [customers] asking us to do full-stadium” in-seat delivery, Anderson said. 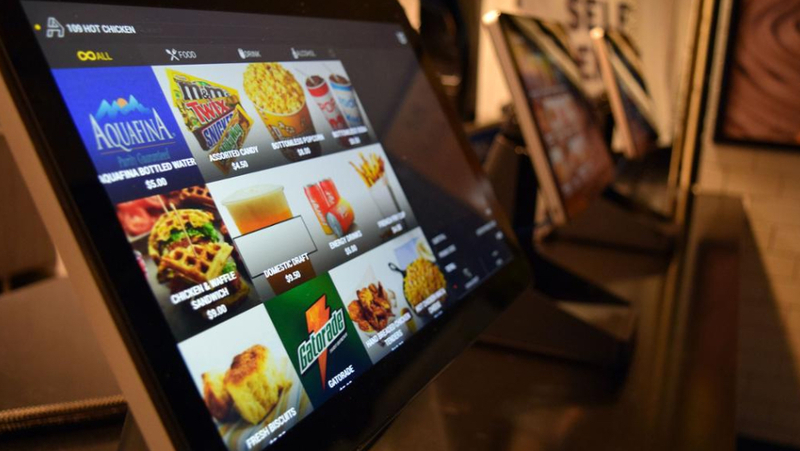 However, having the ability to place an order via a mobile device does have value in premium seating areas, where stadiums may already have systems like the Appetize-based one currently used at Lincoln Financial Field, where servers with wireless devices roam the seating areas offering in-seat ordering as a white-glove service.